Observations of an area of dark sky are made with the SPIRE Spectrometer for every day it is operating. The number of repetitions in these observations is set to match the longest science observation on that day, although sometimes when two consecutive SPIRE days are observed, the long dark sky observation may be on the day before or after the science observation. The location of the dark sky field is 17h40m12.00s, 69d00'00.00''. The following table shows sparse-point dark sky observations that have been made in the normal observing mode (not the bright source mode). The mean instrument temperature is given for the dark sky observation. The final columns show the range of telescope temperatures over the entire day for the primary (M1) and secondary (M2) mirrors. 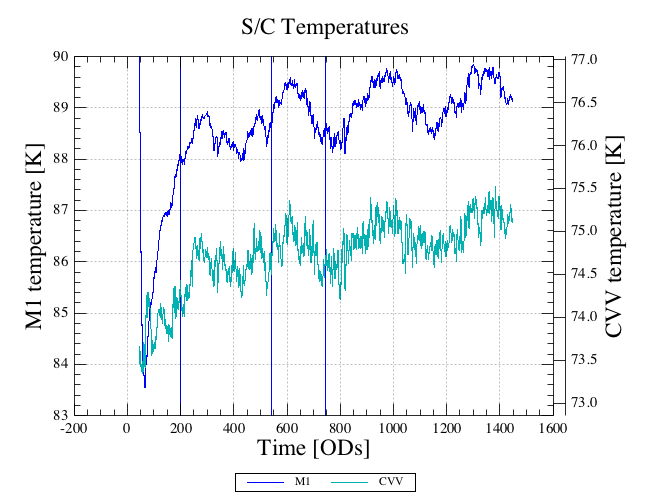 The telescope temperatures for each day are also detailed on the Spacecraft and Observatory page - the variation in primary mirror temperature through the mission (taken from that page) is shown below. These observations are all publically available in the Herschel Science Archive.